Former Flight Controller Jerry C. Bostick. Failure to attend is not an option. Jerry Bostick attended Mississippi State University where he studied Civil Engineering. He joined NASA in 1962 and served as Retrofire Officer and Flight Dynamics Officer during the Mercury, Gemini, Apollo and Skylab programs. He served as Executive Assistant to the NASA Administrator and Special Assistant for Programs, Office of Energy Programs at NASA Headquarters. Upon returning to the Johnson Space Center, he served as Chief of Technical Planning, Manager of Space Shuttle Payload Deployment and Retrieval Systems, Deputy Manager, Space Shuttle Program, and Director of Mission Support. He left NASA in 1984 to become Vice President, Space Systems, Grumman Aerospace Corporation. In 1996, he retired from Grumman and joined United Space Alliance as Assistant Program Manager, Space Flight Operations Contract, NASA’s prime contract for processing and operation of the Space Shuttle. He retired from United Space Alliance in 1998 and now lives in Marble Falls, Texas. Jerry has three children and 10 grandchildren. 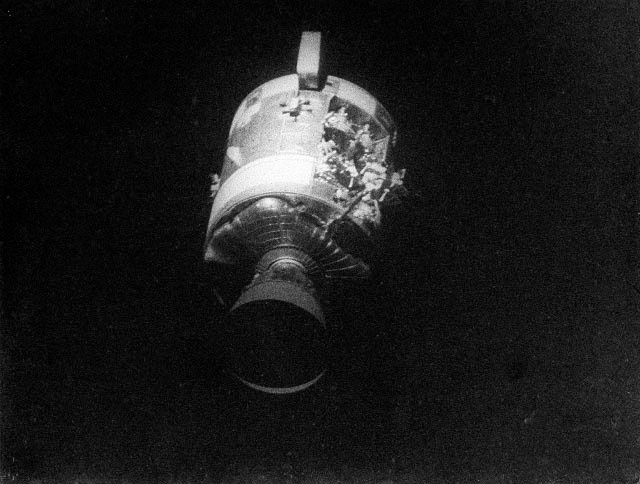 Jerry was a technical adviser on the movies Apollo 13 and Armageddon and the Emmy Award winning HBO television series From the Earth to the Moon. He is a co-author of the book From the Trench of Mission Control to the Craters of the Moon, now in its 3rd edition. 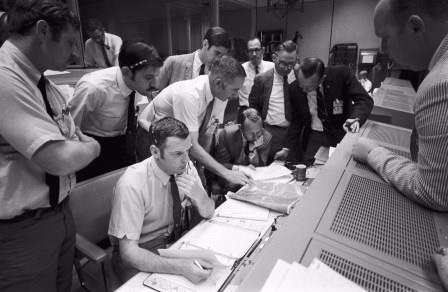 Flight controllers and managers gather around the console of Flight Director Glynn Lunney (seated in white shirt, foreground). At far left, in the dark suit, is Chris Kraft, deputy director of the Manned Spacecraft Center. Jerry is at the back wearing a sports jacket. Credit: NASA. Jerry recently authored a book detailing his varied life and career with the United States space program ‘The Kid from Golden: From the Cotton Fields of Mississippi to NASA Mission Control and Beyond’. Jerry Bostick was eight years old, his family had indoor plumbing installed in their home. He thought they were living in the lap of luxury. In The Kid from Golden, Bostick shares his life story beginning with his birth in June of 1939 in that house in Golden, Mississippi. This memoir narrates a chronological rendering of Bostick’s family and memories and tells about his many accomplishments. 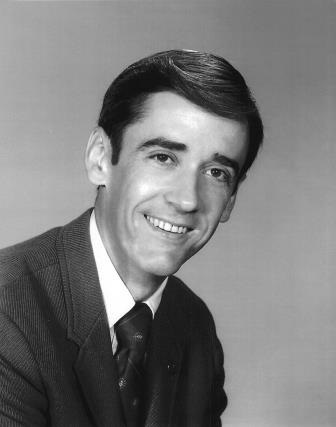 The Kid from Golden discusses his early years growing up in rural Mississippi; to serving as a page in the Us House of Representatives; to attending college; and working at Nasa Mission Control during the Mercury, Gemini, Apollo and Skylab programs, Grumman Aerospace and United Space Alliance. Offering an insightful encapsulation of his career and personal life and the lessons learned throughout, Bostick dedicates The Kid from Golden to his grandchildren. He documents his stories and memories for the benefit of future generations. Jerry: As far as the expression ‘Failure is not an option”, you are correct that Kranz never used that term. In preparation for the movie, the script writers, Al Reinart and Bill Broyles, came down to Clear Lake to interview me on “What are the people in Mission Control really like?” One of their questions was “Weren’t there times when everybody, or at least a few people, just panicked?” My answer was “No, when bad things happened, we just calmly laid out all the options, and failure was not one of them. We never panicked, and we never gave up on finding a solution.” I immediately sensed that Bill Broyles wanted to leave and assumed that he was bored with the interview. Only months later did I learn that when they got in their car to leave, he started screaming, “That’s it! That’s the tag line for the whole movie, Failure is not an option. Now we just have to figure out who to have say it.” Of course, they gave it to the Kranz character, and the rest is history.